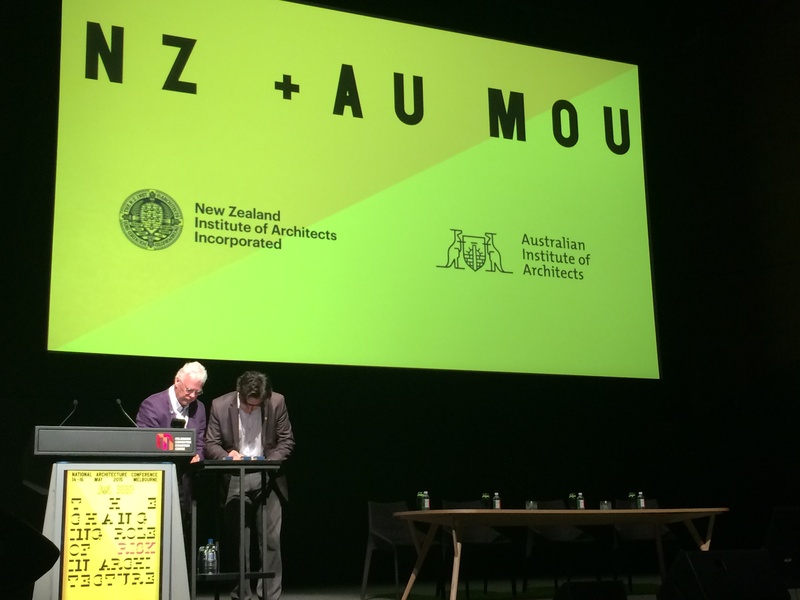 To begin the day, the national president of the Australian Institute of Architects, David Karotkin formerly signed a memorandum of understanding between the Australian Institute of Architects and the New Zealand Institute of Architects. Many in the audience might have assumed many agreements such as this one would have already been in place for decades. It was however a reminder about the work that the AIA is undertaking, often behind the scenes, to strengthen the profession in Australia. 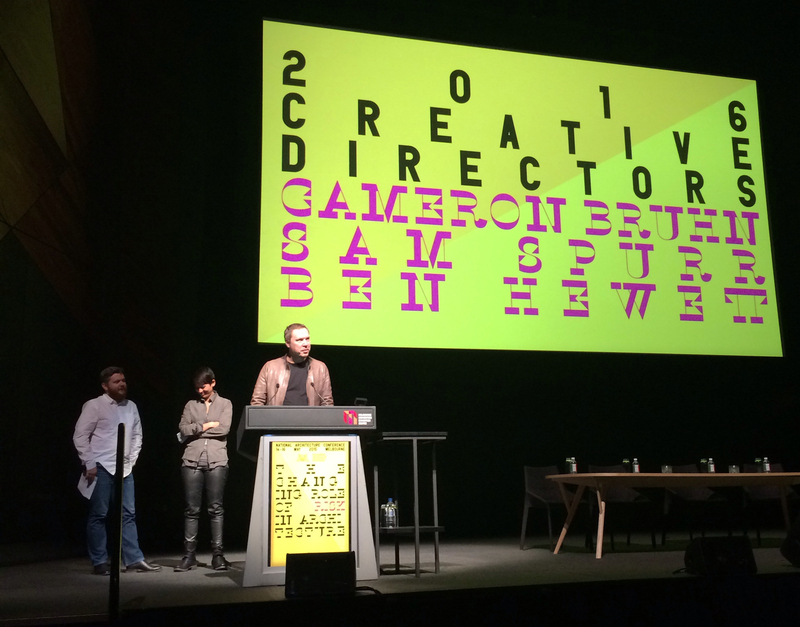 Next up in the morning announcements was the introduction of the 2016 creative directors for the next national conference in Adelaide. Cameron Bruhn, Sam Spurr and Ben Hewett will be putting together the program based on the theme “How soon is now”, a curious title which will no doubt look at possible futures for the profession and for our built environments worldwide. 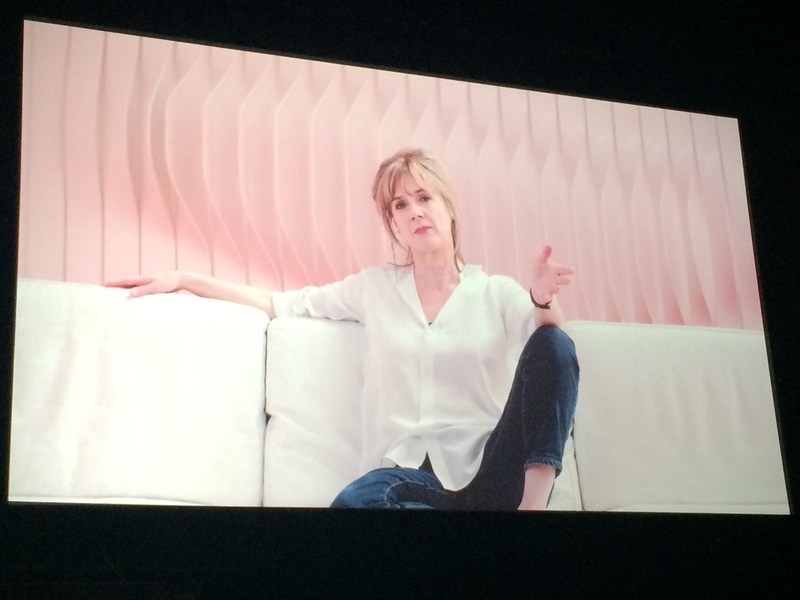 First presentation for the day was Amanda Levete via a professionally produced video. This delivery approach was much more successful than the more risky live video link up from last year conference by Alejandro Echeverri. Levete made an early observation, which echoed Camilla Block from the previous day, that everyone wants the benefits of risk but with fail-safe guarantees. 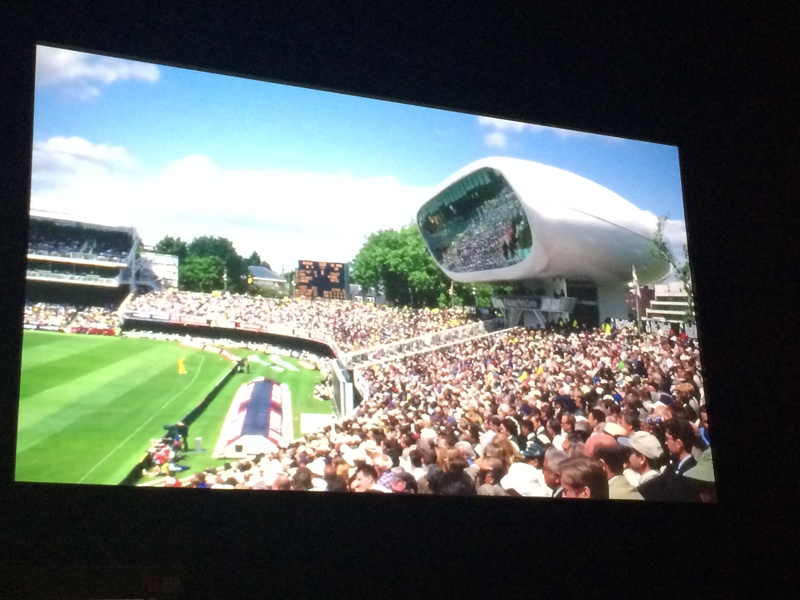 Her first example of risk was the Media Centre at Lord’s cricket ground. To achieve the right built outcome for her beautifully curved building, Levete recognized that the challenges could be overcome by collaborating with the boat building industry to capitalize upon their expertise. What resulted was the worlds first entirely aluminum building. The presentation by Jeremy Till was easily the most polished and professional presentation of at least the last three conferences. As Till paced around the stage using a less formal yet incredibly engaging and humorous approach, the audience might have easily been thinking they were at a TED talk. 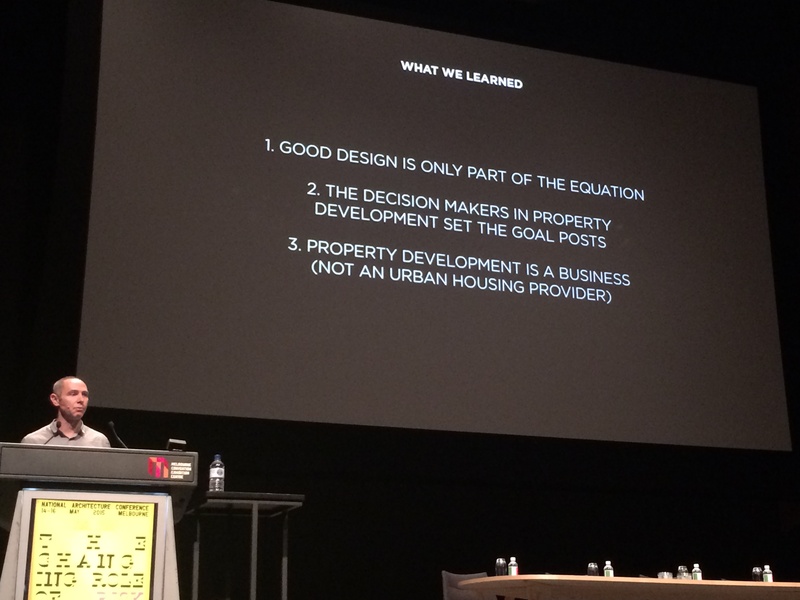 Till was also right on target in his discussion of risk covering areas from pedagogy through to the practice of architecture and architecture the product. Perhaps the most amusing point was his discussion around the regulations of balustrades. The regulations are designed to prevent injury or death of babies by restricting the maximum size of gap that can be allowed. Interestingly the UK and Australia have different sizes leading Till to proclaim that Australians have bigger heads. On a more serious note, Till took aim at the Royal Institute of British Architects in its framing of the profession through its ‘Plan of Work’ document. Till presented a compelling case on how this document places economics above all else and restricts the innovation and risk taking within a project down to a very narrow window. This document it seems is itself a risk to the design process. Property valuer referring to house designed by Till. What makes the critique even more staggering, Till does not own a car and has no intention of doing so. Perhaps the most important aspect of Till’s discussion was in the impact of risk on the broader society. Whilst the wealthy readily insulate themselves from risk it is the poorest who have the most risk to carry. All up, Till’s brilliant delivery and insights specifically on the topic of risk gave him the Red+Black vote for best session of the conference. As the name suggests this session was all about the study of architecture, how it is changing and what it should become. The primary issue that was approached from different viewpoints was the conflict between the education required for registration as an architect and the broader, more fluid and riskier education required to be the 21st century professional that is required. Universities are under enormously challenging conditions from a variety of external influences. 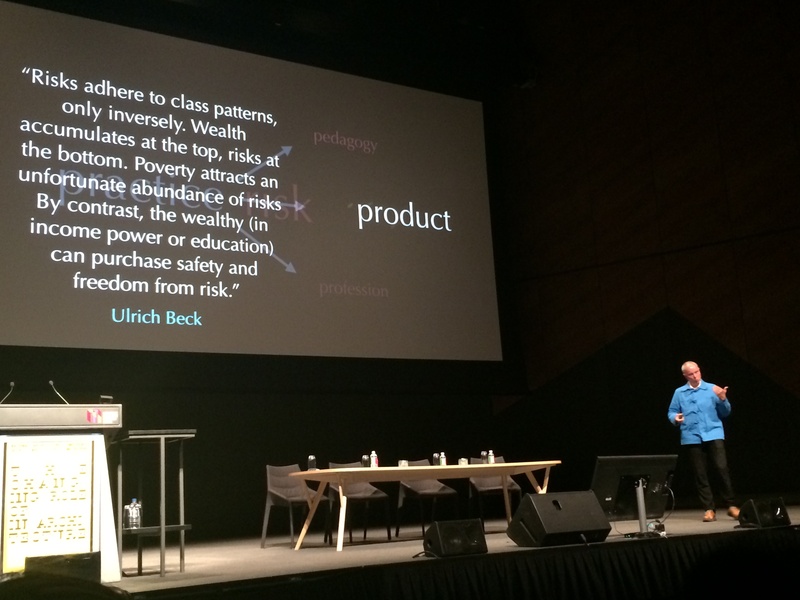 In Australia, university education is becoming more and more a commodity, leading one speaker to describe the problem as ‘the shopping mall of education’. Other challenges include the performance requirements on lecturers which are focused squarely on research output rather than teaching excellence and also the evolution of online university courses which threaten the traditional education approach. Returning to the idea of risk, it was pondered if students take enough risks throughout the studies. This risk taking and broad thinking makes for excellence in design leadership but is time spent not on developing the skills measurable by the university accreditation authorities. This session, whilst not providing many answers, was excellent in provoking wider discussion about education, registration and the profession as the conference delegates took lunch. 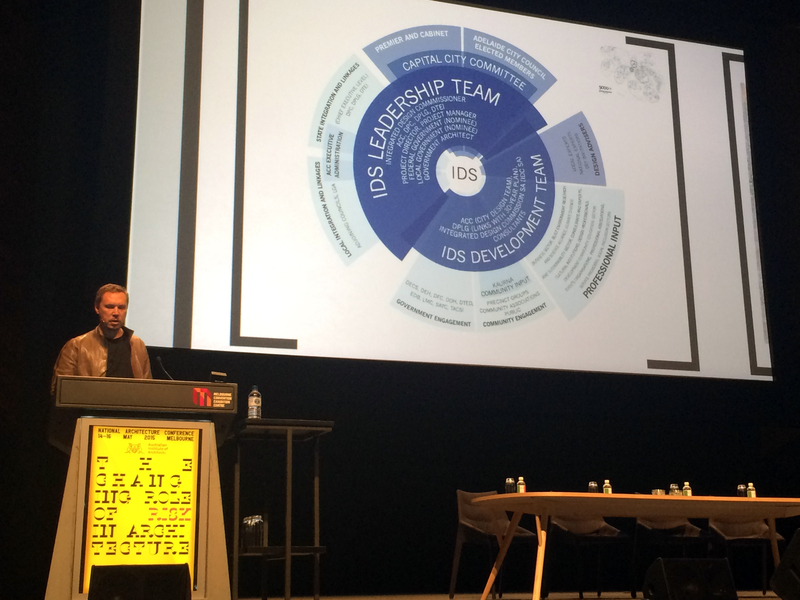 After lunch, Ben Hewett opened dialogue 4 with discussion about his time working for the South Australian Government as the State Government Architect. Listening to the talk highlighted the difficulties and complexities faced by such a position. Indeed at times, just trying to follow the different government bodies and how they would interact was difficult to digest. 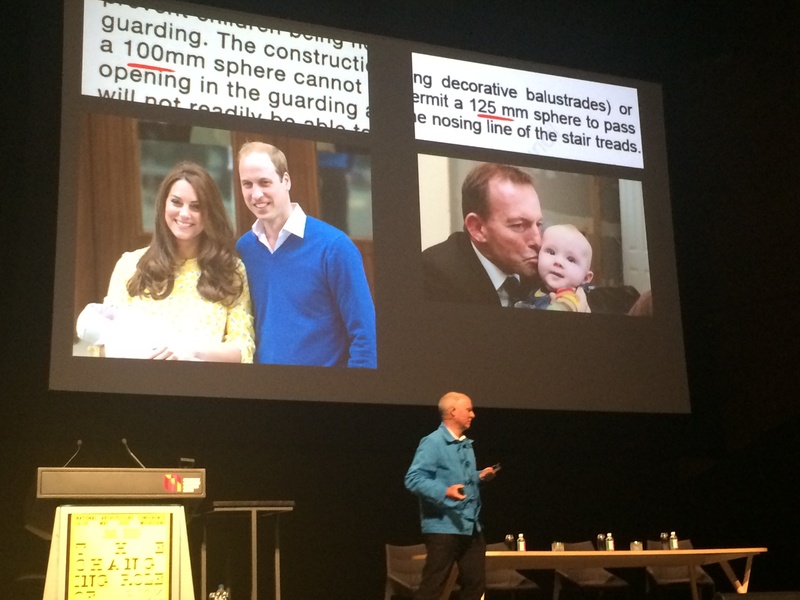 Next up to the lectern was local hero Jeremy McLeod from Breathe Architecture. Jeremy is the driving force behind the award winning ‘The Commons’ Apartments and the Nightingale development model. 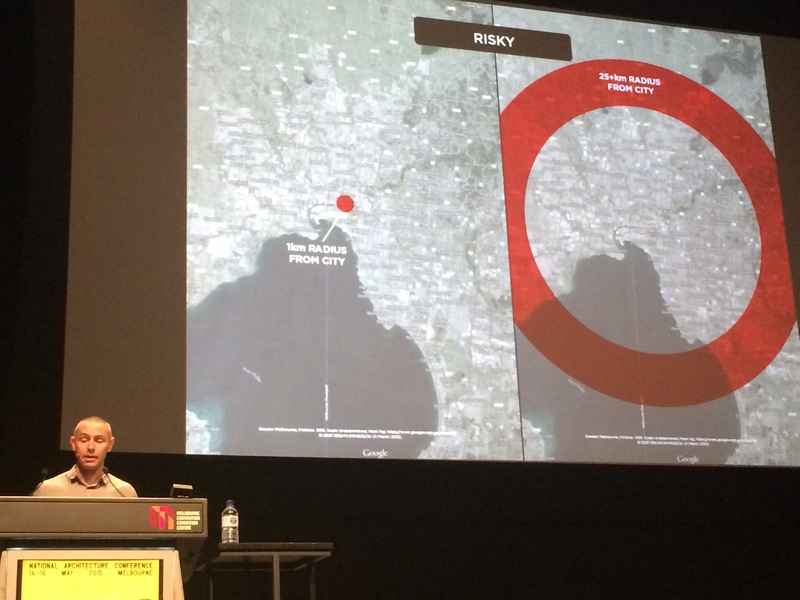 McLeod highlighted the areas most at risk from Melbourne’s projected growth spurt. From the inner city, where high densities are being created with low amenity apartments, through to the outer suburbs where people are being sold into car dependency and extreme travel times. To combat these issues Breathe Architecture developed ‘The Commons’ which was supposed to be the solution to the problem. Whilst it was an outstanding architectural success, winning a truck load of awards (and performing very highly on Rate My Building user experience survey) McLeod sees it as a financial failure as it ultimately had to involve a developer to satisfy the risk averse bank. Fortunately the innovation did not stop there. McLeod has developed the nightingale model further so that on the next project the Nightingale apartments no developer (other than 25 individual ethical investors) will be necessary. McLeod concluded by throwing open the challenge to the audience to get involved and be part of the solution. As an interesting aside the Australian Institute of Architects were offered the $35,000 of legal and financial intellectual property to release for free to institute members. Incredibly, due to risk, the AIA has declined the offer. This revelation warrants a substantial explanation and will be the subject of a Red+Black post at a later date. 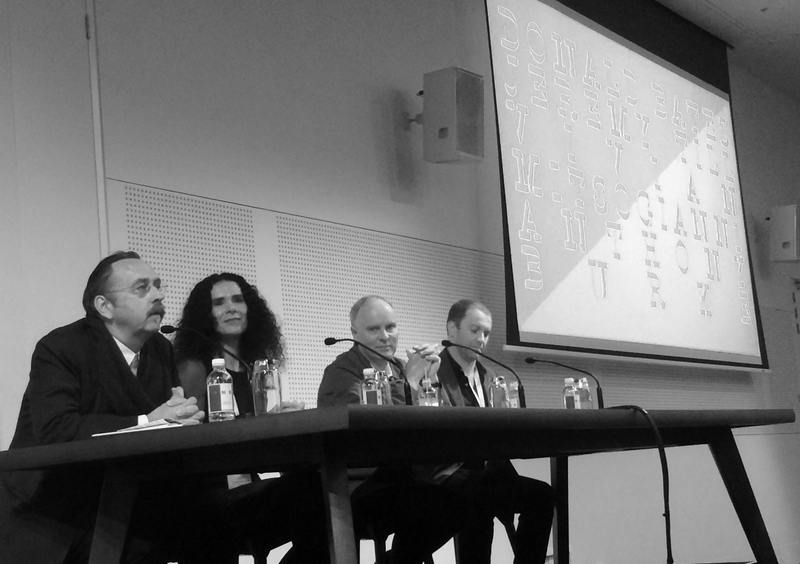 Caroline Bos to Ben Hewett: You have absorbed too much jargon, it will take you a while to recover. Caroline Bos: What kind of job is it that takes you two hours to explain it? Ben Hewett: Working for government! 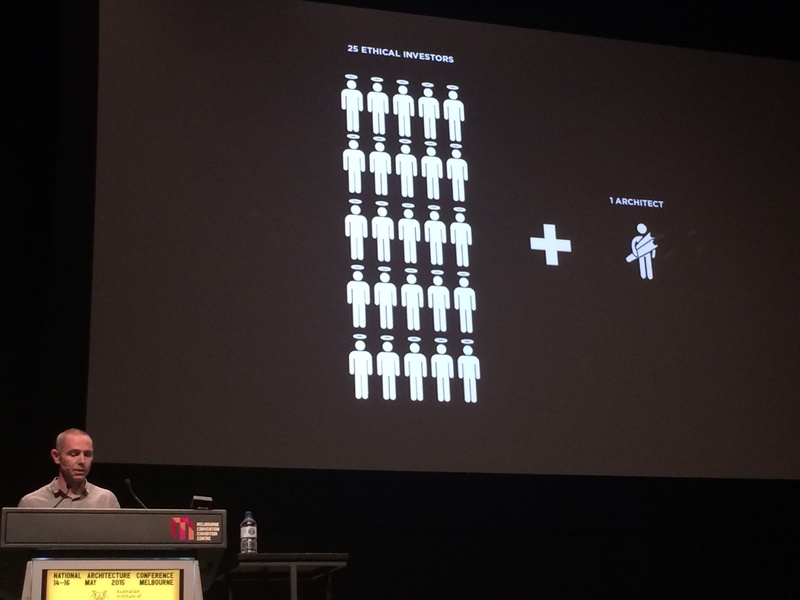 Cynthia Davidson is the founding director and editor of the not for profit organisation Anyone Corporation which aims to advance the understanding of Architecture and its relationship to general culture. Davidson took the audience through her journey as a risk taker which somewhat unexpectedly landed her a position as an architectural editor. 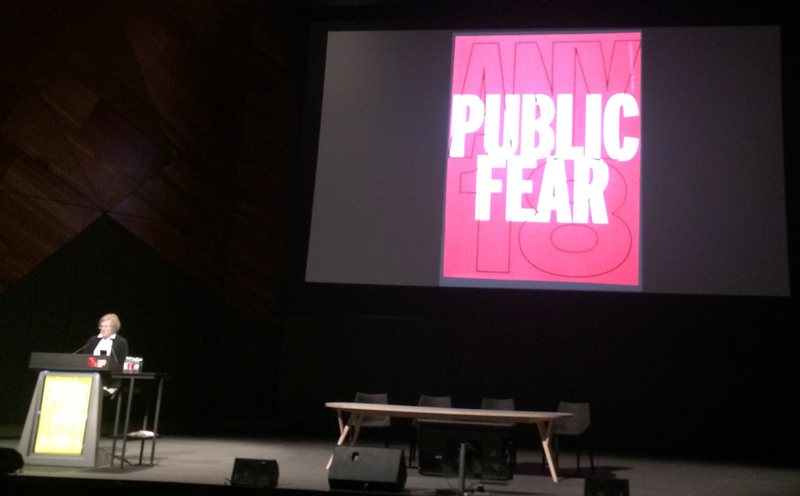 Watching the cultural and architectural response to the Oklahoma City Bombing and the 1993 Terrorist attack on the World Trade Centre, Davidson made critical observations about the narrative of public fear. It is a discussion that is sadly more relevant than ever. On a brighter note, it was also fascinating to see the lives of two of the speakers connect decades before the conference. 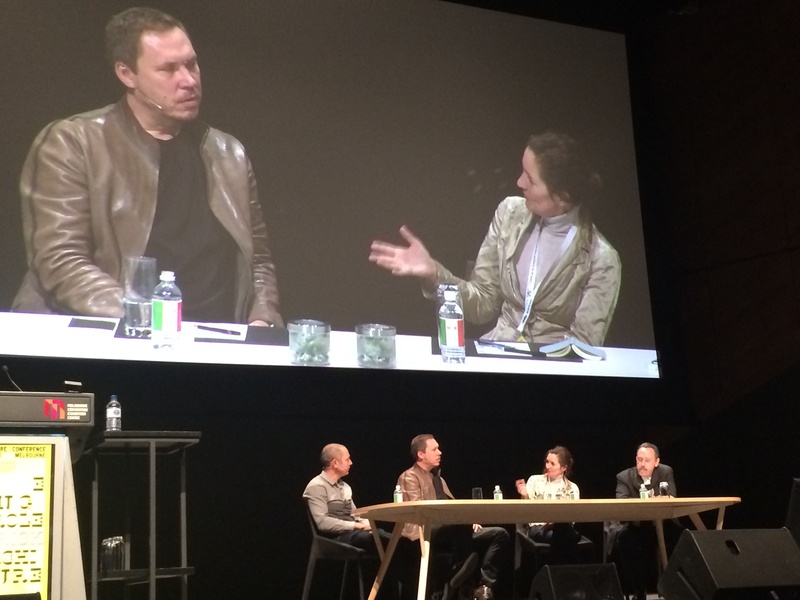 Davidson revealed that she had a very small role to play in connecting client to architect for an early project for SHoP architects. As one commentator, Sonia Sarangi noted, Davidson is proof that you don’t need to be in architectural practice to shape architecture. 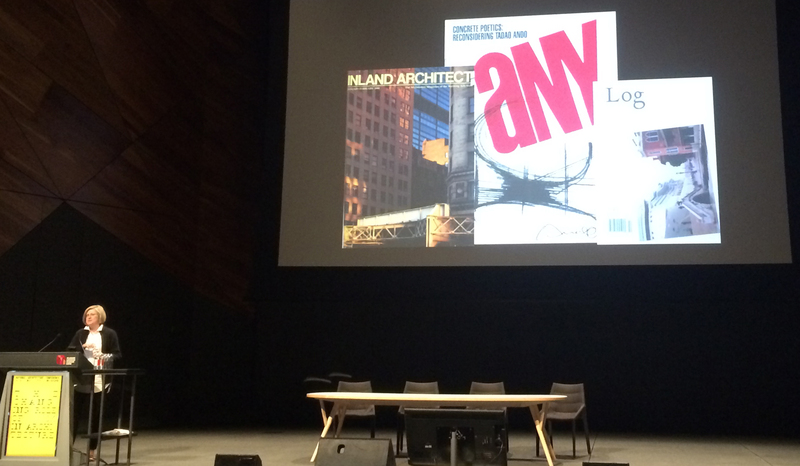 The final speaker for the conference was Kasper Jensen who is a director of the Denmark based architecture practice 3XN. Jensen talked through a range of innovations and projects from 3XN. 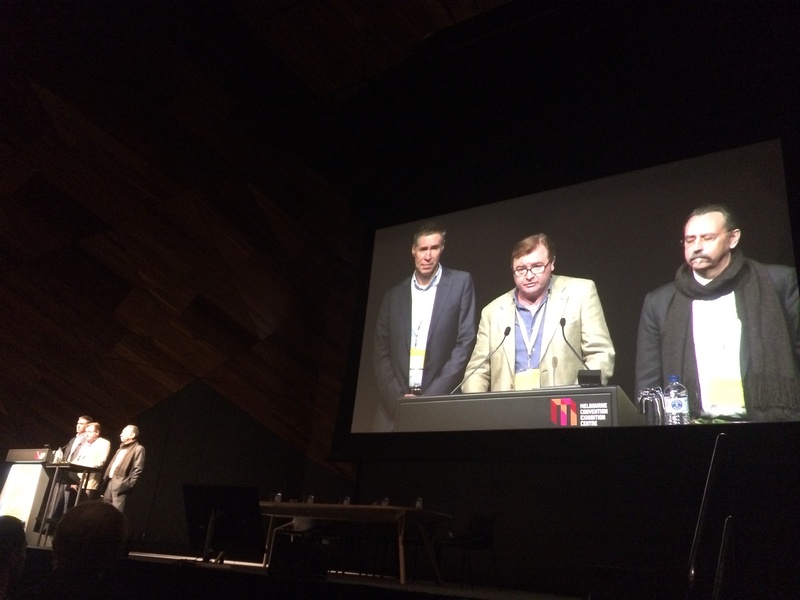 At the conclusion of the 2015 National Architecture Conference, it must be acknowledged that the efforts of the Creative Directors: Donald Bates, Andrew Mackenzie and Hamish Lyon have put together a conference that was highly relevant, engaging and inspiring. 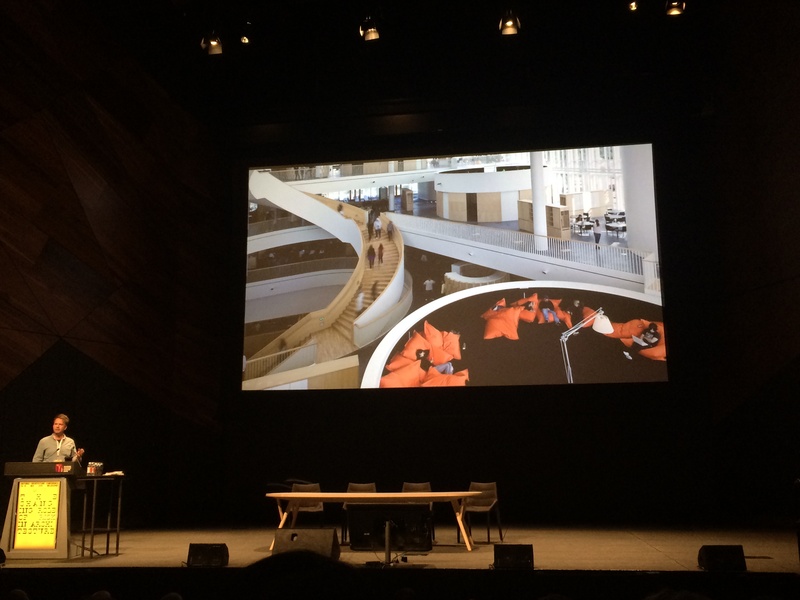 Events such as this one highlight the extraordinary lengths the architecture profession will go to in order to deliver the very best architecture, often in very difficult circumstances. Architecture remains a risky profession in a risk averse world. After keeping the focus on risk so intensively for the last week, maybe it has broadened our understanding to see the positive opportunities more clearly too. 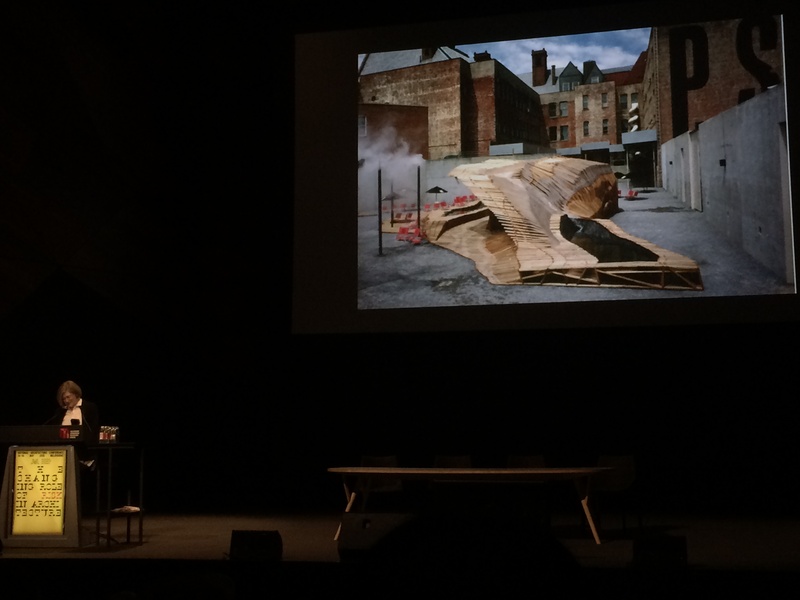 This entry was posted in 2015 Architecture Conference, all posts, construction industry, News and tagged 2015 National Architecture Conference, 2015 National Conference, Amanda Levete, Anthony Burke, Anyone Corporation, Ben Hewett, Cameron Bruhn, Caroline Bos, Cynthia Davidson, Donald Bates, Jeremy Mcleod, Jeremy Till, Kasper Jensen, Nightingale Apartments, Risk 2015, Sam Spurr, THE COMMONS, Vivian Mitsogianni. Bookmark the permalink.